The Centre for Hearing and Communication founded International Noise Awareness Day to promote awareness of the dangers of long-term exposure to noise. Exposure to noise is one of the leading causes of hearing loss. Millions of workers around the world are exposed to dangerous levels of noise in the workplace and it is estimated that one in four workers exposed to high levels of noise in the workplace will develop a hearing loss in the future. Firefighters, police officers, factory workers, farmers, construction workers, military personnel, heavy industry workers, musicians and entertainment industry professionals all work in environments that pose noise risks. Even office staff employed in crowded office buildings with phones ringing and the constant hum of computers, air conditioners and other machinery are faced with the annoyance and increased stress noise creates. Noise in the workplace is bothersome. Beyond that, it can pose a safety risk by reducing concentration and increasing worker injuries. 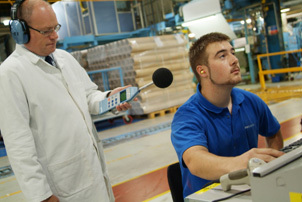 Repeated exposure to high levels of noise in the workplace can cause permanent hearing loss. By law, as an employer, you must assess and identify measures to eliminate or reduce risks from exposure to noise so that you can protect the hearing of your workers. Where the risks are low, the actions you take may be simple and low cost, but where the risks are high, you should manage them using a prioritised noise-control action plan. Pulsar is a reputable manufacturer and reseller of noise measurement products since 1969. For some years now it has been offering courses aimed at professionals from any background seeking an understanding of the key issues relating to the measurement and noise in the workplace. To coincide with the International Noise Awareness Day, Pulsar will be holding a 1-day course at Whipsnade Zoo in Dunstable welcoming safety professionals from a variety of industries. The aim of the course is to raise awareness of the dangers of excessive noise exposure but also to share best practice with like-minded safety professionals. The next Pulsar Noise Course will be held at Edgbaston County Cricket Ground on 5th June 2013. Places are currently available. For all enquiries on noise at work, noise measurement equipment and future noise awareness courses, please consult our website or send us your queries.